Photo Courtesy of CLSA. Governor Palin delivers 90-minute Reagan Conservative speech in Hong Kong. Photo Courtesy of CLSA. CLSA Chairman and CEO, Jonathan Slone introduces Governor Palin and “quoted President Eisenhower on the responsibilities of citizens in a democratic society to debate issues that matter (Wheeler, 2009, ¶3). The Wall Street Journal’s reportage focused on Governor Palin’s Reagan Conservatism; Bloomberg focused on her statements pertaining to the Federal Reserve, and perhaps the most surprising coverage of all came from the New York Times. “A number of people who heard the speech in a packed hotel ballroom…said…she was articulate, well-prepared and even compelling” (McDonald, 2009, ¶2). “Doug A. Coulter, head of private equity in the Asia-Pacific region for LGT Capital Partners” said Governor Palin “beat all expectations (McDonald, 2009, ¶3). “Cameron Sinclair, another speaker at the event, said Mrs. Palin emphasized the need for a grassroots rebirth of the Republican Party driven by party leaders outside Washington” (McDonald, 2009, ¶6). ” ‘She’s definitely a serious future presidential candidate, and I understand why she plays so well in middle America,’ said Mr. Coulter, a Canadian” (McDonald, 2009, ¶8). The most salient quotes came from Melvin Goodé, a regional marketing consultant, who is African-American and an Obama supporter. “[Governor] Palin chose Hong Kong because, he said, it was “a place where things happen and where freedom can be expanded upon” (McDonald, 2009, ¶16). “It’s not Beijing or Shanghai,” he said (McDonald, 2009, ¶17). Mr. Goodé’s closing remarks: “She was articulate and she held her own. I give her credit. They’ve tried to categorize her as not being bright. She’s bright” (McDonald, 2009, ¶21). This is from an Obama supporter! The Fed and the government sent a message to companies that “the bigger that you are, the more problems that you get yourself into, the more likely the government is to bail you out,” Palin said in the closed door speech, according to a tape of the event given to Bloomberg News. “Of course the little guys are left out then. We’re left holding the bag, all the moms and pops all over America” (Kate & Chan, 2009, ¶3). “How can we think that setting up the Fed as monitor of systemic risk in the financial sector will result in meaningful reform,” she said. “The words ‘fox’ and ‘henhouse’ come to mind” (Kate & Chan, 2009, ¶9). “We got into this mess because of government interference in the first place….We’re not interested in government fixes, we’re interested in freedom,” Governor Palin said (Cheng & Frangos, 2009, ¶2). “She described her political philosophy as a ‘common-sense conservatism,’ and said the free-market policies of Ronald Reagan and Margaret Thatcher should be guides for how to get out of the current economic situation. ‘Liberalism holds that there is no human problem that government can’t fix if only the right people are put in charge,’ she said” (Cheng & Frangos, 2009, ¶7). “She called for tax cuts as well as the elimination of the capital-gains and estate tax. Then, she said, the world will ‘watch the U.S. economy roar back to life'” (Cheng & Frangos, 2009, ¶11). “‘We all hope to see a China that is stable and peaceful and prosperous,’ she said. But she added that the U.S. must work with Asian allies in case ‘China goes in a different direction'” (Cheng & Frangos, 2009, ¶14). “On U.S.-China trade relations, Ms. Palin called for more openness and warned against protectionism. ‘We need China to improve its rule of law, and protect our intellectual property,’ she said. ‘On our part, we should be more open to Chinese investment where our national security interests are not threatened'” (Cheng & Frangos, 2009, ¶16). The foregoing compilation clearly documents 90 minutes of pure Reagan Conservatism. In her speech, Governor Palin called for small limited government, states rights, and peace through strength. Supporting the thesis that Governor Palin’s appeal stretches from full right to center-left, she wowed even a die-hard Obama supporter with her speech. This was absolutely a defining moment and a major accomplishment for Governor Palin. Today, an Obama supporter regarded her as brilliant. 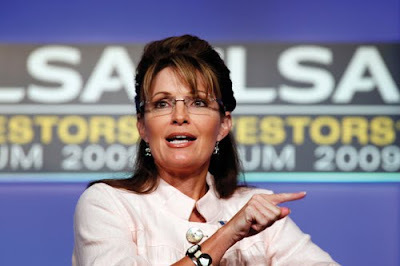 Today, the New York Times, that bastion of liberalism declared that Governor Palin is a credible candidate for 2012. For this speech, Governor Palin earned a sum at least equal to an entire year of gubernatorial pay and one fifth of Obama’s pay. Women all over the world should hold their heads high today. The world is trembling beneath her sonic boom, glass is exploding and the shards are falling to earth…. 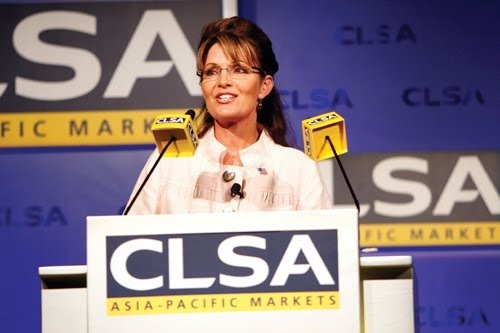 According to Agence France Presse, Governor Palin said on September 23, 2009 the US government was wasting taxpayer’s money and would exacerbate poverty in a 75-minute speech delivered to investors at the CLSA Investors Forum in Hong Kong (CLSA, 2009, ¶1). The speech “covered Alaska, international terrorism, US economic policy and trade with China”(CLSA, 2009, ¶2). An anonymous European delegate regarded her as “brilliant.” (CLSA, 2009, ¶5). The delegate elaborated, “She said America was spending a lot of money and it was a temporary solution. Normal people are having to pay more and more but things don’t get better. The rich will leave the country and the poor will get poorer” (CLSA, 2009, ¶6). She said the Obama’s imposition of duties on Chinese imports was harmful to our relationship with China (CLSA, 2009, ¶11). 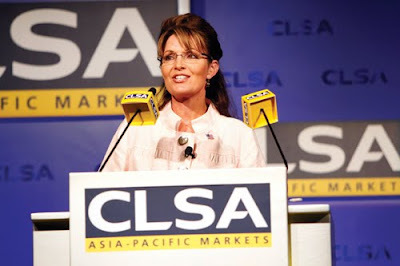 Governor Palin praised President Reagan’s economic policies and lambasted the Obama administration’s interventions in economic affairs (CLSA, 2009, ¶12). She addressed terrorism threats to the United States and traditional allies such as Japan, Australia, and South Korea (CLSA, 2009, ¶13). Governor Palin “blasted Obama’s proposals on healthcare, reiterating a previous statement made to the press that the plan would include a bureaucratic ‘death panel’ that would decide who gets assistance, he said (CLSA, 2009, ¶20). Though no transcript of the speech is available, the Agence France Press (AFP) report as re-broadcast by Breitbart provides a solid summary of what she spoke about and audience reaction. Those with left-leaning ideologies naturally did not like what Governor Palin had to say, and while there were a few of those (CLSA, 2009, ¶4 , 7), most investors liked her speech as indicated by the delegate who regarded it as brilliant. 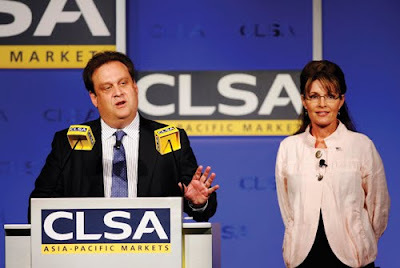 One investor complained the speech over-focused on Alaska as an investment opportunity (CLSA, 2009, ¶15-16). But, Governor Palin is from Alaska, and that state is a significant trading port, and the place to invest in energy markets. If there was over-focus on Alaska, it will likely diminish over time, as Governor Palin transitions into a national role. For her first foreign speaking engagement, Governor Palin’s performance was by this account, nothing short of spectacular.